I've just purchased some mail links and was thinking of making a mail pisane/standard as a lot of the reliefs and drawings of galloglaich have. How is the best way of achieving the look of the carvings/drawings? Should I make it as a large square of mail and then turn it 45 degrees, or is there another way that has worked for people?? Er, seriously ? I'd say 'buy one'. I've made two coifs, and both were a complete pain. The first one was with simple butted mail. I think I spent 30 hours on it before I got annoyed and threw it in the bin. Trying to get the 'start' - the round bit over your crown - to hang right is a complete pain in the backside. The second time, I bought a riveted 'crown' from Steve Forth armouries, then did everything below my hairline myself, with bronze trim, then added a light leather liner. Turned out really well, but it was easily 200 hours work, maybe more. I think I spent €130 on the links alone. You can get a wonderful riveted coif from capapie.co.uk for €1�or so. It's light, strong, looks the business and is shockin' cheap at that price. The construction is tricky as you have to 'flare' the maille by adding extta links at different points. Determining how often you should add these links and where is...tricky. But if you really, really, want to make one, well go for it! Research it thoroughly; make sure you have a 'mould' when making it, like a head-sized football, so you can ensure it's hanging right at all times. Start with one big link, and add maybe 10 to it. Then, working around in a helix, add three links to every two. There are patterns on the internet. Making a single-link mistake at an early stage won't be apparent until you've added two or three thousand links, at that stage you'll realise you've to cut many out, or add in new wedges. Each mistake will cost a few hours of your time. My advice would be to start with a leather dog collar work a long thin rectangle the width of your neck and attach it to it. Then as you said construct a large rectangle and add two isosceles triangles to either end tips at the collar, this escapes the need for expanding link problems then add two smaller rectangles to the back. Then attach strapping to the rear what ever fashion you like. Its a tricky piece to make and I'm actually working on one myself at the minute and this approach seems to be fine. I must say that I find it quite bizarre that when a specific question regarding the construction of a mail standard is posed that John has answered with a synopsis on the difficulties he had in constructing a mail coif, a different - albeit one of mail - animal altogether. 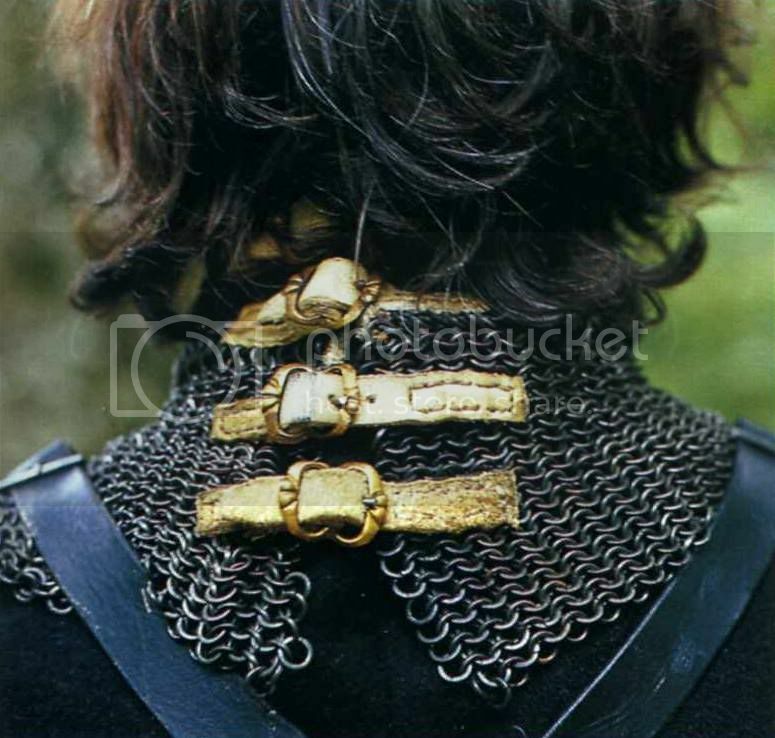 Just to clarify, the difference between a mail standard (or pissane) and a mail coif is that the former is a neck/shoulder piece usually strapped or tied at the back of the wearer's neck whilst a coif is a hood of mail which covers the entire head - bar the face - and the shoulders. It appears that the mail standard replaced the earlier coif and aventail types (mail hanging directly from the helmet itself) over the course of the fifteenth century. The standard is buckled by four straps at the back and has a liner of calf-leather at the throat to lend comfort and form. Although the basic construction is essentially a simple rectangle of mail, each end is 'graduated' to allow a more comfortable fit. Small triangles of mail decorate the lower edge of the standard as was often depicted on contemporary illustrations including Durer's famous engraving of 1521. 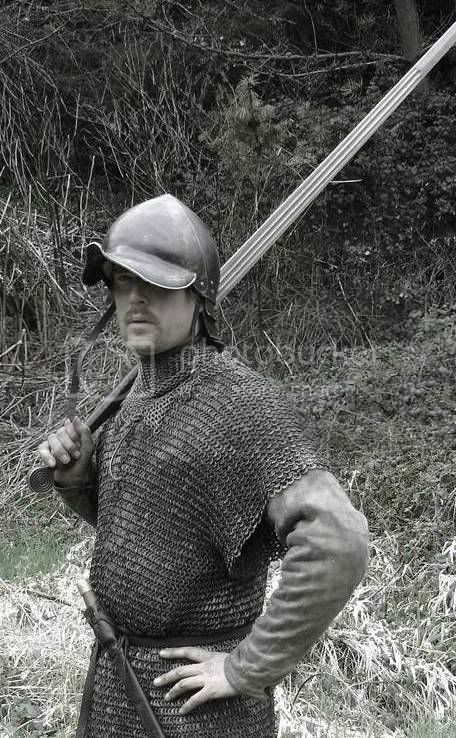 Above is my reconstruction of an early 16thC gallóglach showing the standard being worn with a contemporary uncombed early burgonet and characteristic long coat of maille and below is a reproduction from Gerry Embleton's 'Medieval Military Costume' (The Crowood Press, 2000, ISBN 1 86126 371 6, p. 62) showing the standard's strapping at the back. My standard just took a few evenings to put together and was well worth the effort. Hope this helps. Good luck with that Frodo. The stitching is probably the biggest pain of it but their's not too much of it at least! Swifty wrote: I must say that I find it quite bizarre that when a specific question regarding the construction of a mail standard is posed that John has answered with a synopsis on the difficulties he had in constructing a mail coif, a different - albeit one of mail - animal altogether. Er. Yeah. Not the most lucid these days, working too late...as Brendan said, I ordered in a standard from him, and it's um..completely different from a coif.